Photo opportunity: At the end of the pier, turn toward the beach for a great picture of the town and its backdrop of rolling hills. 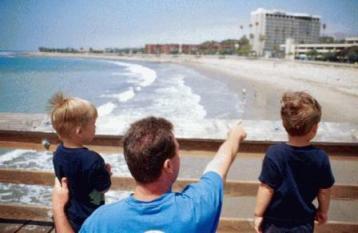 To the pier's west is Ventura's Promenade beach area. To its southeast is San Buenaventura State Beach two miles of sand with lifeguards on duty in season. The beach is one of 85 state parks in California offering free AT&T wireless Internet access, or Wi-Fi. Oh, look! That tall hotel just west of the pier, the one you noticed because it's the ONLY tall building in Ventura? that's the Crowne Plaza Ventura Beach. Not only does every room have a terrific ocean view, but so does the roof, or at least its Ventura surf cam does. The Web cam is aimed 24/7 at Surfer's Point Beach. From the pier, travel east along Harbor Boulevard to San Buenaventura State Beach's San Pedro Street entrance to access its group picnic, barbecue and lawn area. Head west from the pier to visit Surfer’s Point Beach, which fronts the county fairgrounds, officially known as Seaside Park - one of the few county fairgrounds in California right on a beach: San Diego County's fairgrounds are on the beach in Del Mar. Visit during the Ventura County Fair each August for surf, livestock and a ride on a Ferris wheel that overlooks the ocean. Head south of downtown and visit Ventura Harbor and the information center for Channel Islands National Park. Staying in Ventura? Be sure to visit our link to hotels near Ventura city beaches, our directory of Ventura restaurants and our Santa Barbara pages for day trips to this beautiful community just north of Ventura. Come Back Soon: We'll be adding more beach news. 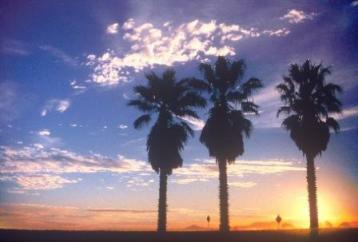 Photos courtesy of Ventura Convention and Visitors Bureau. Return from the Ventura City Beaches page to the Ventura page.